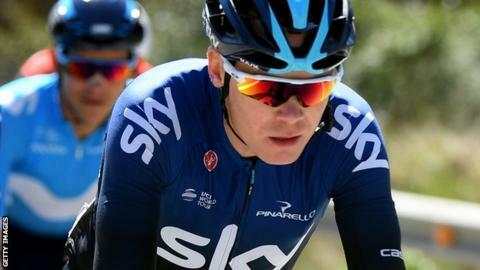 Britain's Chris Froome suffered a nasty fall as Australian Michael Matthews secured victory on the second stage of the week-long Volta a Catalunya. The Team Sky rider, 33, scraped a large area of skin off his right thigh in the crash inside the last 40km of the stage from Mataro to Sant Feliu De Guixols. Froome was able to continue but did not attempt to rejoin the peloton. "Someone hit Froomey and he slid and crashed. We'll monitor him but it seems he is OK," said Sky's Nicolas Portal. "It was a tricky corner which had a few roadworks on the right and was also quite bumpy," added Team Sky sports director Portal. Froome eventually finished 13 minutes behind Team Sunweb's Matthews, who beat world champion Alejandro Valverde into second in an uphill sprint. Lotto-Soudal's Belgian rider Thomas de Gendt extended his overall lead to two minutes 47 seconds. Britain's James Knox finished the stage in sixth place and - along with compatriots Simon and Adam Yates and Hugh Carthy - is two minutes and 58 seconds off the lead. The Volta a Catalunya is Froome's first event since the Tour of Colombia in February.